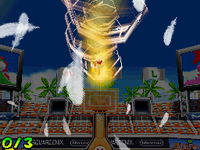 The Wing Shot is Paratroopa's Special Shot in Mario Hoops 3-on-3. To perform it, the player must tap out the letter N twice. Paratroopa begins the shot by flying in an infinity symbol (∞) shape twice as the ball takes on an orange glow and bounces in an N shape. Paratroopa then flies backward and quickly spirals into the basket, with a tornado and feathers trailing him. If shot outside the 3-point line, instead of flying backward, Paratroopa will perform an upwards corkscrew before shooting the ball toward the basket. As always, a teammate needs to catch the ball and complete the shot. This page was last edited on March 28, 2018, at 17:21.